My old apartment building had 18 or so units in it and it was full of young professionals and students. It had a nice vibe to it. People said hello in the courtyard wearing jaunty hats and pushing cool bicycles, myself included. I called it Hipster Mayberry. One day in the laundry room I saw a note taped to a post with a drawing of a sensitive band t-shirt. Some guy had lost it and plead with the laundry users to return said t-shirt to 3R as it had sentimental value. I thought it was so sweet and sad and typical for the building’s demographics. Today I went to do some laundry in the utility closet downstairs and almost backed my head into this. This just would not happen in Hipster Mayberry. 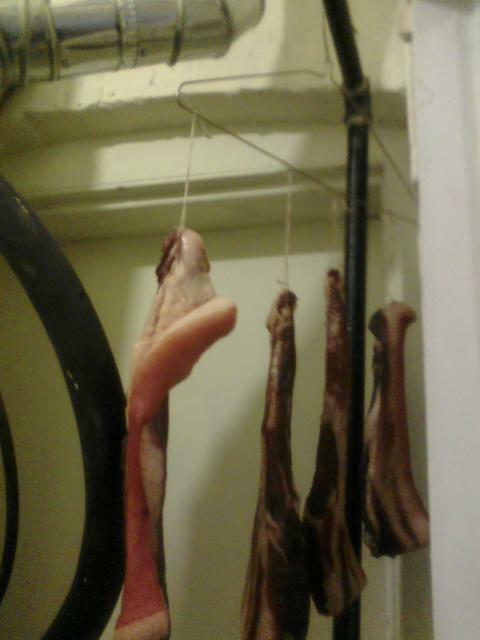 Category: neighbors Tags: band t shirt, cured meat on a hanger, laundry room, what's in your utility closet? best last sentence of a post…maybe EVER.